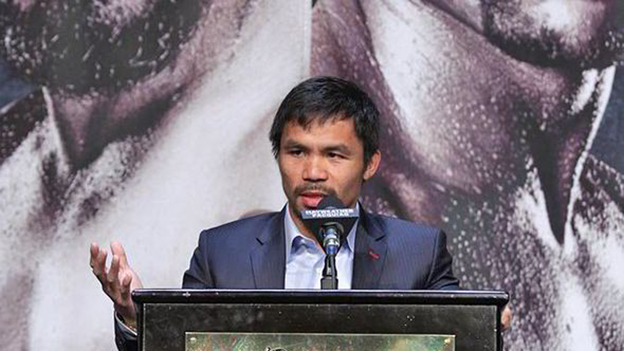 Manny Pacquiao is set to donate half of his £80m fortune from fighting Floyd Mayweather Jr to charity. Ring legend Sugar Ray Leonard warned Pacquiao about being too generous in the build-up to Saturday’s fight at the MGM Grand Arena in Las Vegas. But the Filipino’s promoter Bob Arum has revealed his man will no doubt give half of it to good causes. He said: “I’m sure half of what Manny earns in this fight is going to go to charity. That is just Manny. Pacquiao is keen to help his struggling compatriots as the Filipino congressman’s influence in the country rises. The WBO welterweight champion will run for president in the Philippines once his fighting career comes to an end.